In case you didn’t notice, the bullion has quietly made a comeback as stocks fell. On Friday, spot gold surged $22.20 (2.4%) to reach $927.20 an ounce, the six-month high (see the following chart from Market Club), after a government report showed that GDP contracted at an annual rate of 3.8% in the last quarter of 2008, the most in 27 years, after a 0.5% decline in the third quarter. The two consecutive negative quarterly GDP growth also marks the official start of a recession, even though economists have long declared that the recession actually began in December 2007. Let’s get back to gold. 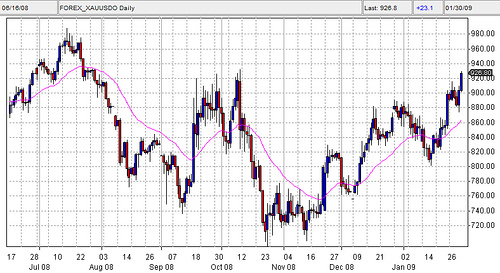 After breaking through the $1,000 milestone in March 2008, gold has gone through some rough time. As economies around the world slipped into recession, demands for commodities fell sharply and the appeal of precious metal also faded. At the end of October, gold even dropped below $700. But since then, gold has regained most of the lost ground. Investors again looked at gold as safe haven amid turmoil in stock markets. But where is gold heading from here? Back to $1,000? Or, as somebody else predicts, $5,000 in 5 years? There’re also arguments that gold may stay at the current level for a while before any breakthrough. What might happen to gold prices, no one knows (we are in a crazy market). But it good be a good way to hedge against further economic turmoil, future inflation and a good diversification plan in 2009. I think we will be at a $1000 sometime this month.